China’s Tianzhou-1 cargo spacecraft arrived at its orbital destination Saturday morning, successfully docking with the Tiangong-2 space laboratory to conclude the first chapter in a pathfinder mission of around five months to validate the country’s orbital cargo architecture is ready to support a large modular space station to be established in the coming years. The ‘Heavenly Vessel’ – the heaviest spacecraft launched by the Chinese to date – blasted off atop the second Long March 7 rocket on Thursday, enjoying a ten-minute ride into orbit to begin chasing the Tiangong-2 module that has been in orbit since September 2016 and hosted a crew of two for a record-setting month-long mission. Orbital-raising maneuvers on Thursday and Friday positioned the 12,910-Kilogram Tianzhou-1 craft for a fully automated rendezvous, culminating in docking at 4:16 UTC on Saturday. 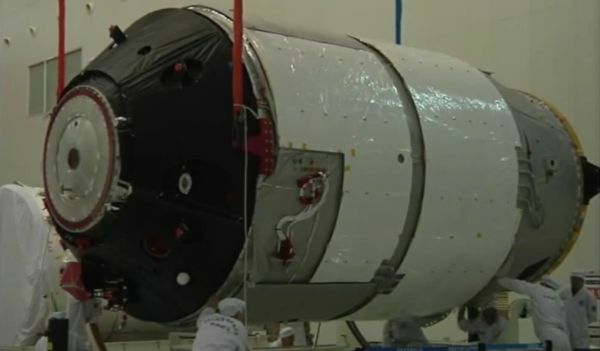 Forming China’s largest orbiting complex, Tiangong-2 and Tianzhou-1 will remain docked for several weeks, facilitating a series of checkouts including the first transfer of propellant from Tianzhou’s tanks to the partially empty tanks of the TG-2 vehicle – marking an important objective of the mission to ensure the Chinese Space Station (CSS) can be refueled in orbit to stay operational for many years. Tianzhou’s mission is expected to be five months in duration and feature three separate docked phases before the spacecraft will be purposefully removed from orbit. Toward the end of the flight, TZ-1 will demonstrate orbital maneuvers for an expedited rendezvous profile that could enable Chinese crews to reach their orbital destination in a matter of hours as opposed to the two-day trek currently flown by the Shenzhou crew craft. The Tianzhou-1 mission marks the conclusion of China’s second phase in a multi-decade program that aims to establish a permanent human outpost in Earth Orbit for ground-breaking science and as stepping stone toward crewed exploration of the Solar System. Initiated in 1992 under the code name Project 921-2, the program outlined three major phases – the first with the goal of sending a human into orbit, the second dedicated to learning the tools for operating a space station and the third phase aims at deploying a large modular space station to orbit. The first development phase reached its conclusion in 2003 when Yang Liwei spent 21 hours in space aboard the Shenzhou-5 spacecraft. Phase 2 was largely centered around the Tiangong modules launched in 2011 and 2016, serving as orbiting test beds to learn lessons for the design of future space station modules as well as operational aspects such as in-space navigation, automated docking, extended human habitation in space and an orbital logistics architecture. 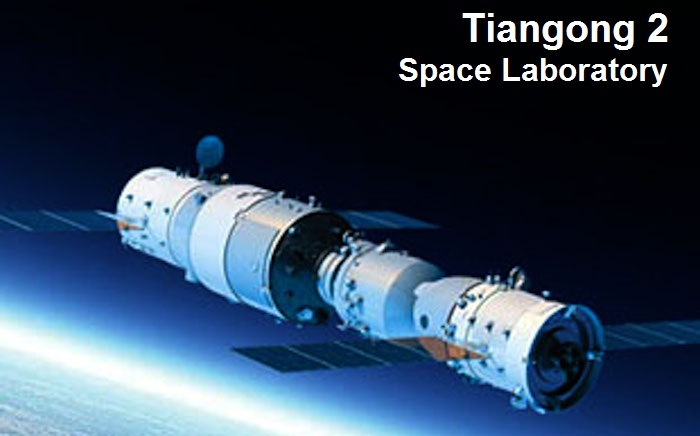 Tiangong-1, launched in September 2011, served as a target for the uncrewed Shenzhou-8 mission that demonstrated China’s first docking in orbit – putting the state-of-the-art radio and laser guidance system to the test in different lighting conditions. Shenzhou-9, carrying a crew of three, flew to TG-1 in 2012 and demonstrated an automated and manual docking maneuver with the crew spending a total of eight days aboard TG-1. Shenzhou-10 in 2013 remained docked for 12 days, enabling its three crew members to learn lessons associated with living in space for an intermediate-duration mission. The Tiangong-2 spacecraft, although appearing identical to TG-1 from the exterior, implemented lessons learned from the two missions visiting Tiangong-1 – ranging from straightforward changes like adding more and better positioned hand & footholds, to more complex modifications like the addition of noise reduction systems to make the crew environment more friendly. Astronauts Jing Haipeng and Chen Dong visited Tiangong-2 in October aboard their Shenzhou-11 spacecraft, setting a new record for China’s longest crewed space mission and working through a busy schedule of scientific experiments. 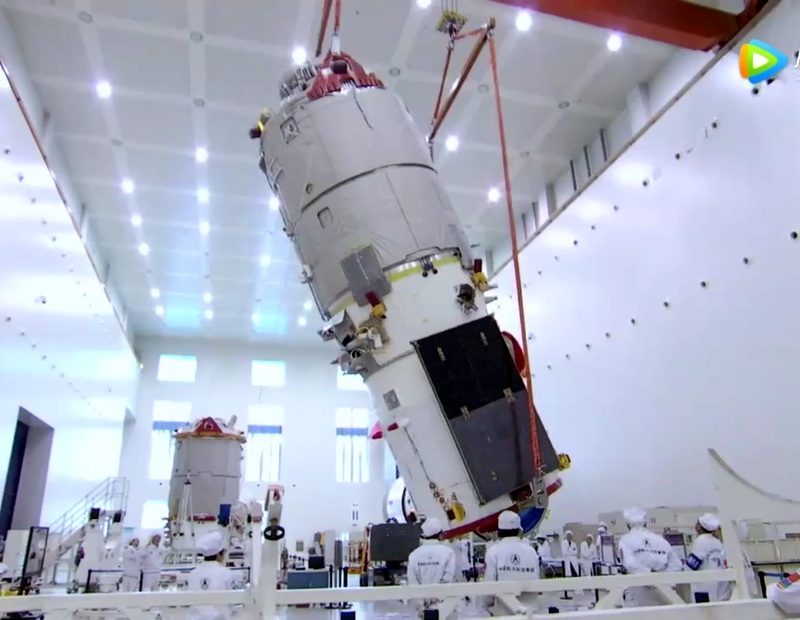 The last major objective for Tiangong-2 is serving as the target for the Tianzhou-1 cargo mission for an end-to-end demonstration of China’s cargo architecture to retire risks before deployment of the first module for the CSS. Knowledge gained with the Tiangong-2 mission directly feeds into the development of the Chinese Space Station that will comprise the Tianhe Core Module, currently expected to launch in 2018 atop a Long March 5 rocket, and at least two large science modules called Wentian and Mengtian. 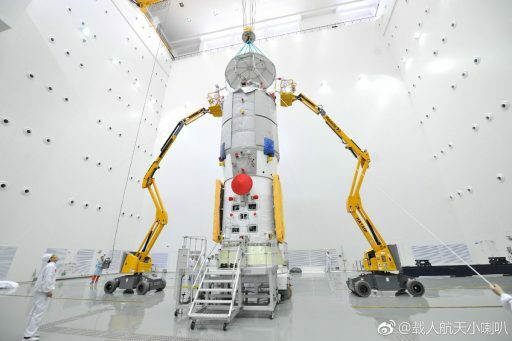 Per current plans, Tianhe’s launch will be followed by the Tianzhou-2 cargo craft that has to dock with the core module before the first CSS crew can launch aboard the Shenzhou-12 spacecraft to begin outfitting the station in preparation for more module additions. 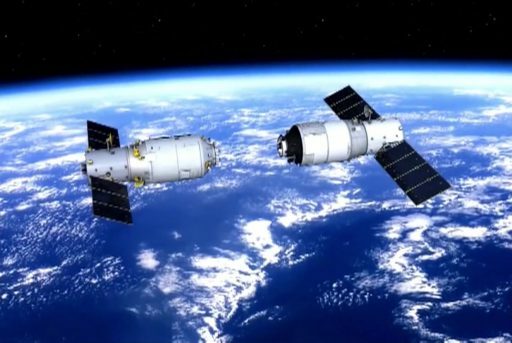 The 60-metric ton Chinese Space Station is foreseen to be fully operational by 2022, hosting a permanent crew of three for six-month increments to carry out scientific research and learn about the human factors involved in long-duration space missions. Long-term operation of the CSS will require a steady pace of crewed launches and cargo deliveries to keep the complex staffed at all times and stocked up on food, fuel and supplies. 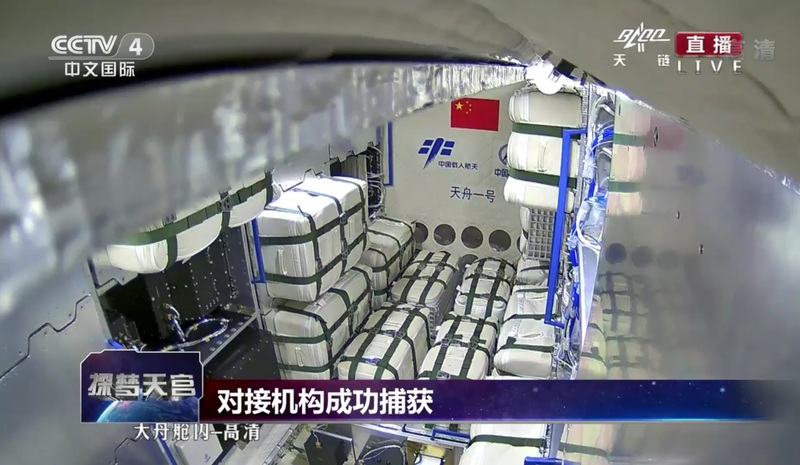 The Tianzhou cargo craft is largely based on the Tiangong design, comprising a Service Module and a large Orbital Module serving as the cargo carrier that will fly either in a pressurized configuration for the delivery of internal supplies, an unpressurized version to haul large external payloads to CSS, or as a combination of the two to carry internal cargo plus external components. All in all, the spacecraft stands over ten meters tall, its widest section is 3.35 meters in diameter and the craft can take on up to 6,500 Kilograms of cargo. Tianzhou-1 has a launch mass of 12,910 Kilograms to simulate a full cargo delivery, although no internal cargo can be transferred to Tiangong-2 as hatches between the two craft will remain closed since there is no crew on the TG-2 craft to complete the transfers. 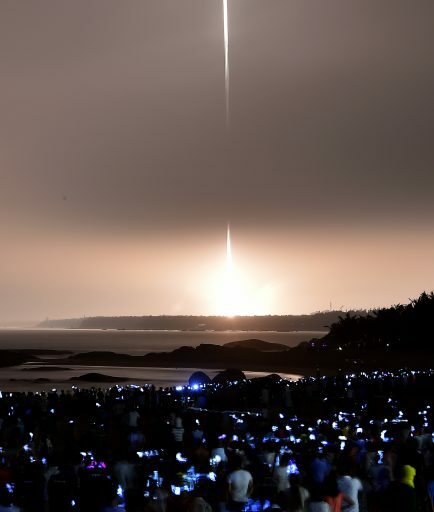 Tianzhou’s mission started with an 11:41:35 UTC blastoff from the Wenchang Satellite Launch Center on Thursday, blazing into the night atop the second Long March 7 rocket. Long March 7, part of China’s new line of rockets, first flew in 2016 and will become the country’s future workhorse, designed for Low Earth Orbit Logistics and launches of heavy satellites to Geostationary Transfer Orbit as well as crewed launches that will switch to CZ-7 after the rocket proves its reliability. Racing to the south-east to depart Hainan Island, Long March 7 dropped its LOX-Kerosene-fueled boosters 173 seconds into the mission and the first stage handed powered flight over to the four-engine second stage 12 seconds later for the final push into orbit via a six and a half minute burn. 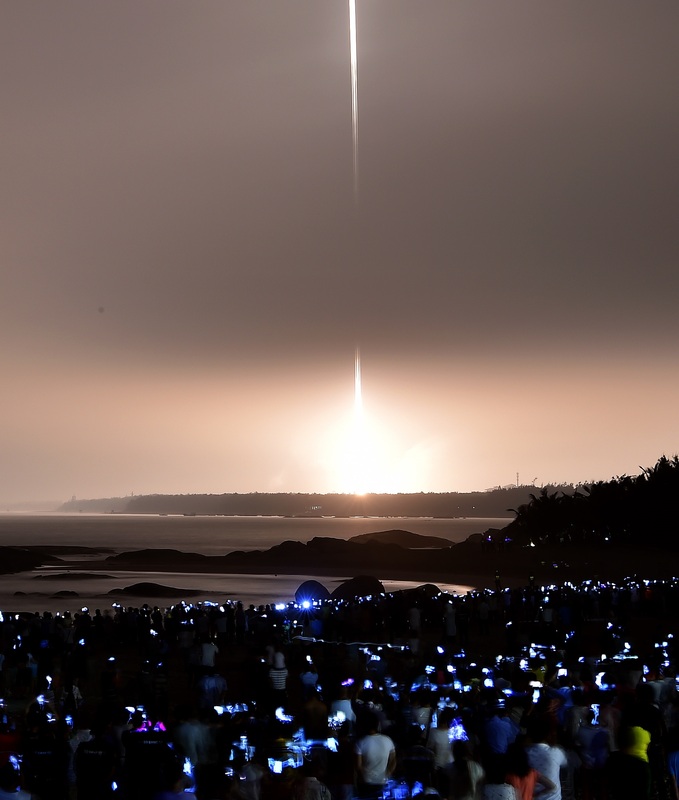 Tianzhou-1 separated from the carrier rocket ten minutes and one second after liftoff, arriving in an initial orbit of 200.0 by 383.4 Kilometers, at an inclination of 42.8 degrees. 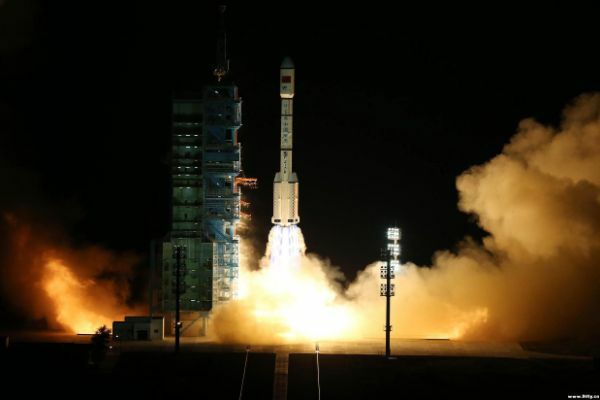 From there, the spacecraft was set for a series of maneuvers to reach Tiangong-2 in its 380 x 390km orbit. 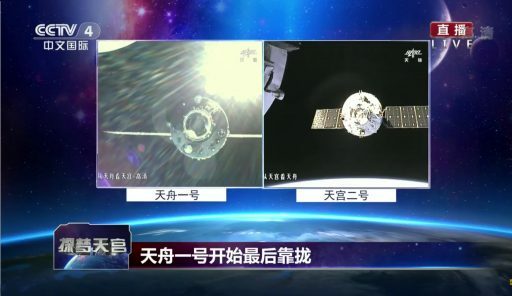 After is successful ride into orbit, Tianzhou-1 pulsed its thrusters to stabilize its orientation ahead of deploying the two solar arrays and establishing contact through China’s Tianlian data relay satellites that cover much of the craft’s orbital treks around the planet. A pair of orbital adjustment maneuvers occurred in the first hours of the flight and the vehicle was found in a 311 by 369-Kilometer orbit on Friday, according to tracking data from U.S. Space Surveillance. A third maneuver around 7:33 UTC on Friday positioned the spacecraft for the initiation of the rendezvous early on Saturday. Tianzhou-1 activated its radio and laser-guided navigation system and the relative navigation phase of the rendezvous started when the craft arrived within 52 Kilometers to its orbiting target. Through the far-field phase of the rendezvous, navigation data was provided by a UHF radar that brought TZ-1 to a first hold point at a distance of five Kilometers before commands were sent to allow the approach to the next stopping point, reached around 3:55 UTC. 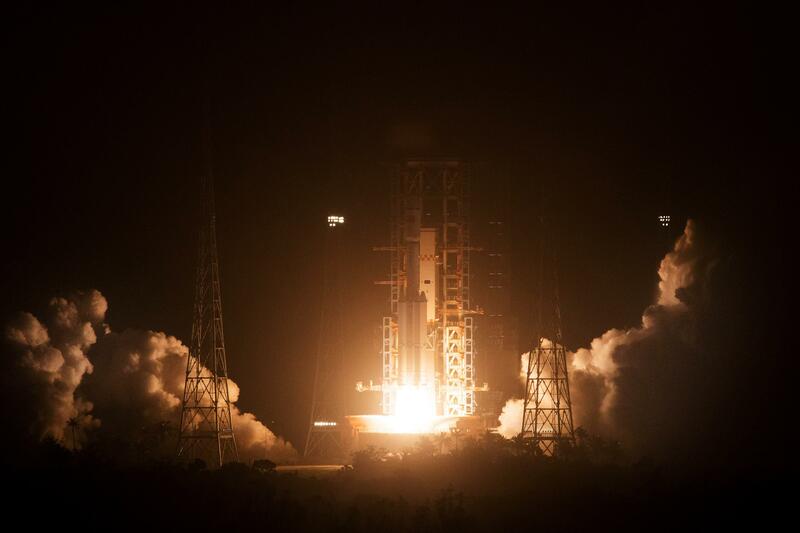 Holding steady at 400 meters, Tianzhou-1 fired up its laser-based electro-optical navigation system that hosts sophisticated software to determine the distance, range rate and relative geometry between the two spacecraft. A smart computer logic compares data from both spacecraft to determine whether their status is within allowable parameters for each stage of the rendezvous. The smart rendezvous logic is designed to function without crew or ground interaction, automatically holding the approach for corrections when needed. 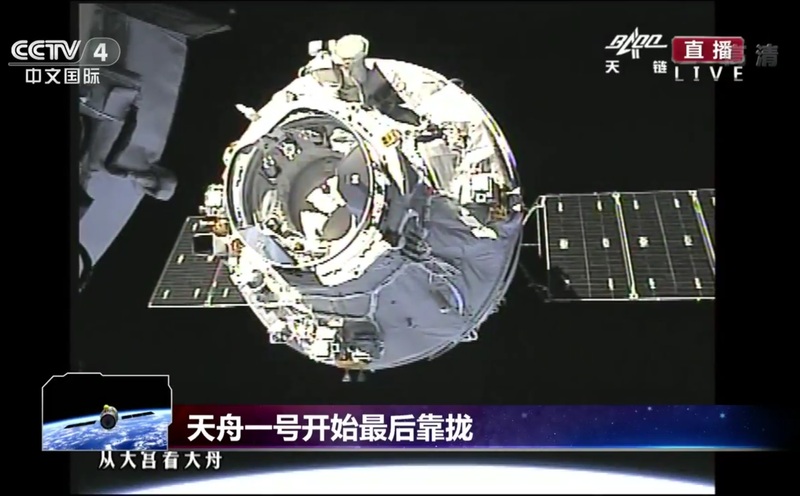 Lining up for a straight-in approach, Tianzhou-1 came to a third halt at 120 meters to provide time for controllers on the ground to assess the positioning of the spacecraft. A final hold at 30 meters facilitated the transition between the far-field and close-range laser reflectors on the Tiangong craft. 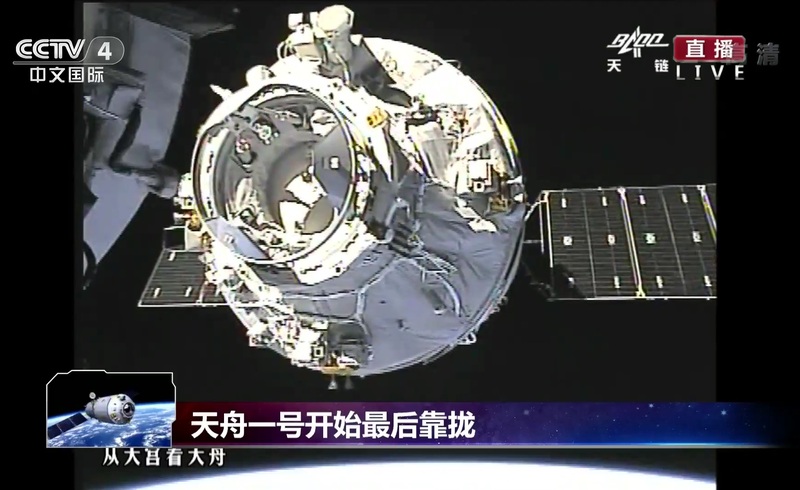 Firing its maneuvering thrusters, Tianzhou-1 initiated the final approach to docking – a slow and deliberate maneuver aiming for contact at a speed of 0.2 meters per second and an error of less than 18 centimeters. 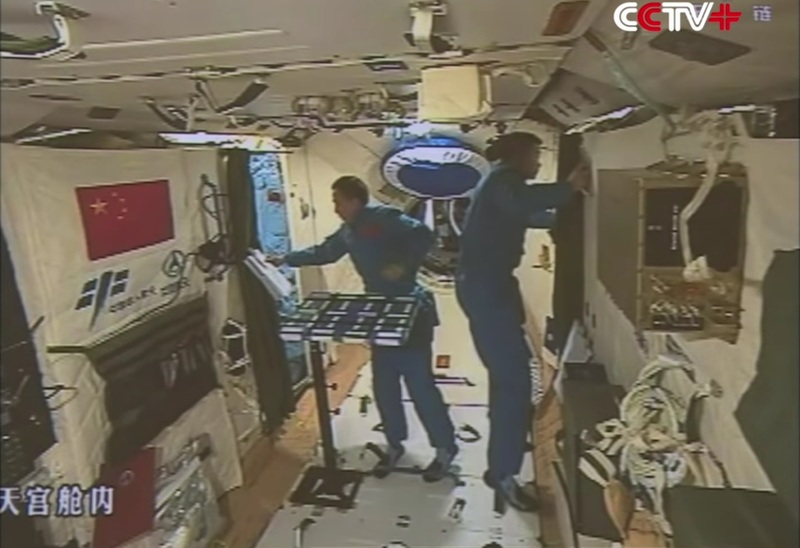 Saturday’s docking operation also focused on China’s second generation docking mechanism installed on Tiangong-2 and TZ-1, marking the first in-space coupling of the new mechanisms as the previous Shenzhou missions flew with the 1st generation docking system. 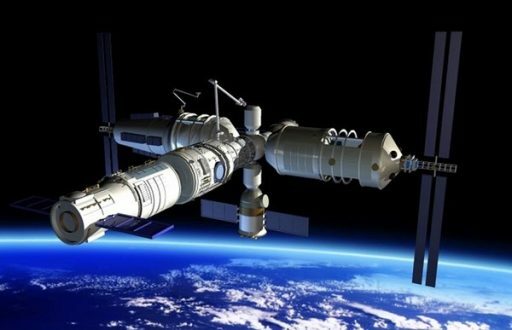 The second generation of China’s docking mechanism hosts structural improvements to support load transfer between heavy space station modules, four fluid interfaces to accomplish the transfer of propellants and advanced dampers to prolong the structural life of the station by avoiding excessive loads. Saturday’s rendezvous marked a rare occasion where the chasing spacecraft outweighs its target vehicle with TZ-1 weighing nearly 13 metric tons while the TG-2 complex was limited to a launch mass of eight metric tons by its Long March 2F launch vehicle. 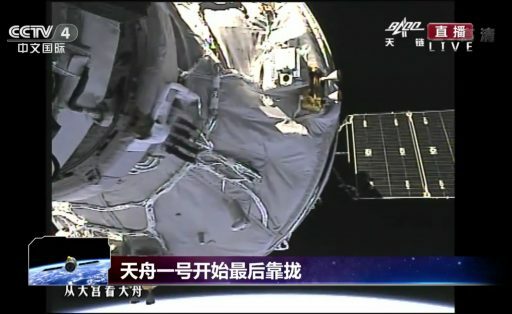 As the active spacecraft, Tianzhou-1 had extended its docking ring while Tiangong kept its APAS docking mechanism in the passive state with the ring fully retracted. China uses a variation of the Androgynous Peripheral Attach System (APAS) that was in use for the Apollo-Soyuz Test Project in the 1970s as well as the Space Shuttle program on both, Mir and ISS missions. 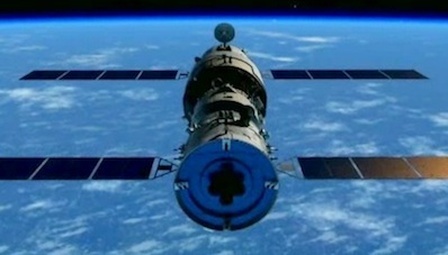 Contact was confirmed at 4:16 UTC while the 21-meter long Tiangong-Tianzhou complex was flying 384 Kilometers over the Indian Ocean. 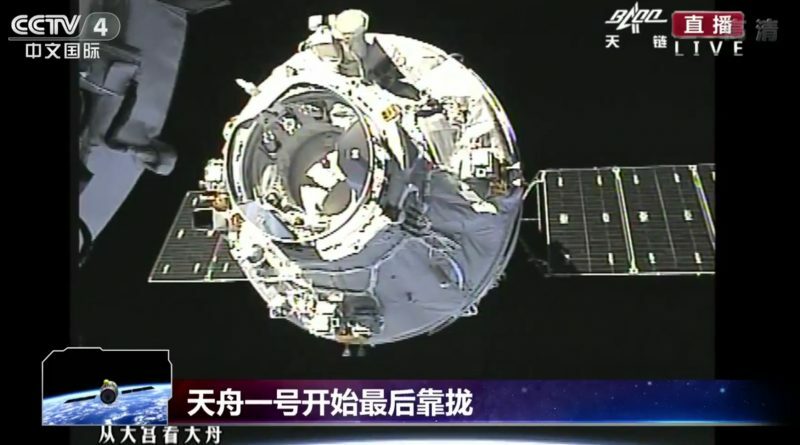 With a safe soft-docking, relative motion was allowed to dampen out before Tianzhou commanded its docking mechanism to retract the ring and tightly pull together the two docking rings, in the process securing the coupling via 12 locking-pins. The first docked phase of the mission is expected to last several weeks and host the first refueling demonstration before Tianzhou heads off on a free flight to set up for a re-docking and another round of fluid transfers to demonstrate the repeatability of the transfer operation that entails priming the propellant and pressurant lines, the actual transfer of fluids and safing/purging the lines prior to undocking. The third approach to Tiangong-2 will see TZ-1 execute a simulated fast-track rendezvous to demonstrate an expedited flight profile for future crew launches. In addition to its demonstration mission, Tianzhou-1 is hosting a number of microgravity experiments exploring the physics of fluid phase change mechanisms in the absence of gravity, examining the characteristics of non-Newtonian gravitation and supporting the development of an innovative medication that could reduce bone loss encountered by astronauts in space and help treat bone-loss diseases on Earth. TZ-1 is also carrying a 3U CubeSat – SilkRoad-1 – that will be released during the mission.